China is preparing to conduct a flight test of a new missile capable of destroying satellites in space, one of Beijing’s most potent asymmetric warfare weapons. Test preparations for the Dong Neng-3 anti-satellite missile were detected at a military facility in central China, according to Pentagon officials familiar with reports of the impending test. Intelligence agencies were alerted to the impending test by China’s announcement of air closure zones covering the expected flight path of the DN-3. The flight test could come as early as Thursday, the officials said. Asia watcher Henri Kenhmann reported on his website Eastpendulum.com this week that missile tests were expected from the People’s Liberation Army satellite launch facility known as Jiuquan, located in Inner Mongolia, and a second launch complex at Korla, located in Xinjiang, western China. The expected tests were based on Chinese government announcements of air closure areas for Dec. 7 and Dec. 8 near those sites. Kenhmann said the flight tests could involve a missile defense interceptor test. China’s ballistic missile defense and anti-satellite missile programs are closely intertwined. After Beijing came under international criticism following a 2007 anti-satellite missile test that left thousands of pieces of floating debris in space, it began conducting its anti-satellite missile program under cover of a missile defense system. The last time China tested a DN-3 anti-satellite missile was Oct. 30, 2015 from the Korla Missile Test Complex. The anti-satellite missiles are part of what the Pentagon calls “counterspace” forces, part of China’s large-scale military buildup. “The PLA is acquiring a range of technologies to improve China’s counterspace capabilities,” the Pentagon’s latest report on the Chinese military said. In addition to missiles and lasers, China also is working on small maneuvering satellites that can grab and destroy orbiting satellites. Richard Fisher, a China military affairs specialist, said the DN-3 appears to be based on the Kuaizhou-1 (KZ-1) mobile space launch vehicle. “It’s about the same size as the DF-31 solid fuel mobile intercontinental ballistic missile (ICBM),” he said. Fisher, senior fellow at the International Assessment and Strategy Center, said the DN-3 could be capable of hitting satellites more than 18,640 miles away in space—more than enough to reach large U.S. surveillance satellites that occupy orbit 186 to 620 miles from earth. 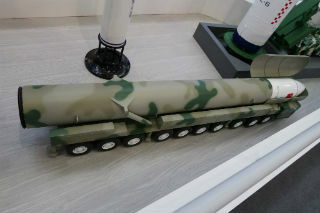 “In late 2016 or by mid 2017 the PLA may test a larger solid fuel mobile space launch vehicle called the KZ-11, with a 2-meter diameter motor similar in size to the new large and multiple warhead armed DF-41 ICBM,” Fisher said. Another space launcher on a mobile transporter is being developed called the Long March-11 (LM-11). “Both the KZ-11 and the LM-11 are four-stage solid fuel mobile missiles that could also be used for anti-satellite missions,” Fisher said. “The bottom line is that the PLA now has at least two deployed ground-launched, mobile, solid fueled direct-ascent ASAT [anti-satellite] systems and may be able to soon field two more larger third generation ground-launched ASAT systems,” he added. The anti-satellite weapons programs are believed to be under the PLA’s new Strategic Support Force, a dedicated space warfare and cyber warfare service set up in late 2015. The developmental KZ-11 and LM-11 systems may be used by China to target U.S. Defense Support Program (DSP) early warning satellites, along with high-orbit Global Positioning System (GPS) navigation satellites. The DN-3 is known as a direct-ascent anti-satellite missile that destroys satellites with a warhead that rams into orbiting systems at high speeds. The DN-3 is also said to have the capability to intercept ballistic missiles in flight. If the DN-3 test is carried out, it will be China’s ninth known anti-satellite missile test. An earlier anti-satellite missile test was carried out in July 2014. For both the October 2015 and July 2014 tests, China asserted the tests were part of a missile defense interceptor program. U.S. officials, however, said both test involved anti-satellite weapons. A Chinese Foreign Ministry spokesman did not return an email seeking comment. Frank Rose, assistant secretary of state for arms control, verification, and compliance said in February 2015 that Beijing engaged in deception about the 2014 test. “Despite China’s claims that this was not an ASAT test; let me assure you the United States has high confidence in its assessment, that the event was indeed an ASAT test,” Rose said. “The continued development and testing of destructive ASAT systems is both destabilizing and threatens the long-term security and sustainability of the outer space environment,” he added. Chinese netizens posted photos of the purported 2015 ASAT test near Korla, showing contrails said to be the result of the missile. China also has two additional anti-satellite missiles known as the SC-19 and DN-2.